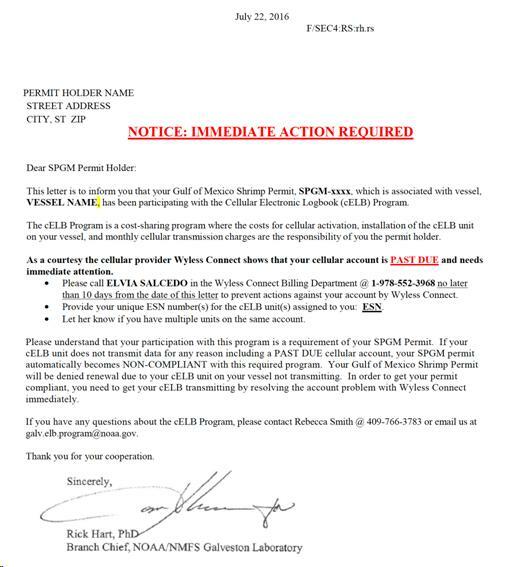 Federal regulations require all SPGM permit holders that have been selected to participate in the cellular Electronic Logbook (cELB) Program to pay the monthly cellular transmission costs to the service provider: Wyless Connect. This is mandatory and the program provides data that is essential for the Gulf Shrimp fishery to continue to operate under Federal statutes. If you fail to pay your cellular service bill from Wyless Connect, NMFS will not renew your Federal permit to fish in the Gulf of Mexico. Once NMFS terminates a SPGM permit, it cannot be renewed or reissued. There is nothing SSA or anyone can do if you lose your Federal shrimp permit for failure to pay your Wyless Connect bill. Please see the following letter which is being sent to every delinquent account holder. NMFS has provided this letter to SSA in advance as a courtesy so that we can get the word out. If you plan to pay your bill, have not received a bill or have any dispute or questions regarding your bill, we strongly urge you to contact Wyless Connect immediately as instructed below. Please know that all account holders need to check your emails as e-mail is the only way the Wyless cellular company bills customers and corresponds with their customers. To that end, all Wyless Connect account holders need to have a valid email address. We also suggest that you notify Rebecca Smith at NMFS of your plans to rectify the situation. Again, if you fail to correct this problem, NMFS will not renew your Gulf Shrimp Permit.